Many important websites around the world paint an image of a city that possibly exists somewhere in the world, but not in Peru. Renowned websites, talk about robberies in taxis and assaults. This may be a problem in Lima, but in Cusco you will not hear about it. What’s more, to be safe in Cusco, you just have to follow the basic safety rules. Cusco receives about 3 million visitors a year; and your biggest concern should be to book in advance the Ticket Machu Picchu, especially if it comes in high season. 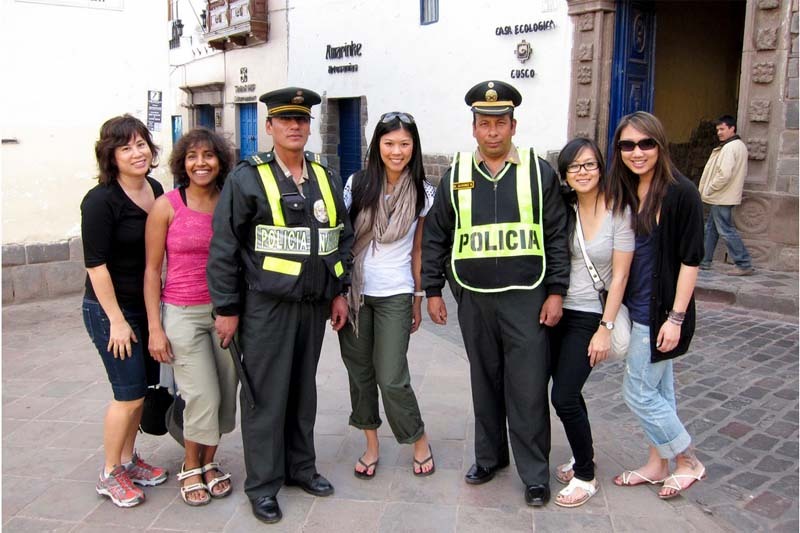 Cusco is one of the safest cities in Peru. False warnings about security in Cusco, causes some people to get a misconception.Do not be afraid to come to Cusco, it is a beautiful and tranquil place; just worry about enjoying every minute of your time here. At present there is little or no criminal activity in Cusco. There are almost no serious incidents, much less in the “security corridors” where you will travel, through the city of Cusco or on your way through the Sacred Valley of the Incas to Machu Picchu the few events are very isolated. If you are traveling by bus from Lima to Cusco or other cities in the country, we recommend you hire the services of established companies; these are relatively easy to identify; among the companies we recommend, is Cruz del Sur, Ormeño or Tepsa. You will need to carry your passport with you at all times, as it is the only way to identify yourself in a country other than yours. To get around the city use the authorized taxis, they have a sign with the number of the company at the top, we also recommend to agree the rate, before boarding the taxi, this more for your safety, for your peace of mind; there are many well-known companies in the city, you can take a taxi to any part of the city. If you are making the trip to Machu Picchu on your own, it is much cheaper to move around the Sacred Valley of the Incas in the public service; you will also be interested in how to get from Ollantaytambo to Machu Picchu. The best way to get to know Cusco is as part of an organized tour. We can organize your trip to Machu Picchu and if you wish, of any tour, excursion or trek in Cusco; just contact us at info@boletomachupicchu.com. Although this is something that every traveler knows, we will remember it. It is a good idea to notify a reliable third party of your destination and the address of the place where you are staying before leaving for a long trekking in the city of Cusco. The treks in the Andes are beautiful, but they have their risks. For more specific queries, please contact us through the e-mail or any of the means at your disposal. These are the free emergency numbers that you can communicate while you are in Cusco or anywhere in Peru. What precautions should you take in Cusco? You will be safe in Cusco, but like in all the tourist cities of the world, you must take some precautions; like being aware of your belongings, or not allowing another person to buy the drinks for you, unless you clearly believe that you know them. A few drinks of Pisco Souer can take you to an amazing night of madness, most tourist bars and restaurants will call a taxi for you.